Author(s): Arundhati Chandrashekhar Lele, Deepak Amarnath Mishra, Tengku Karmila Kamil, Sanjib Bhakta, Mariam Sohel Degani. Department of Pharmaceutical Sciences and Technology, Institute of Chemical Technology, Matunga (E), Mumbai 400019, India. Development of new drugs is a time-consuming, hugely expensive and an uncertain endeavor. The pharmaceutical industry is looking for cost-effective alternatives with reduced risks of drug failure. Validated target machinery along with established inhibitors indicates usefulness in drug design, discovery and further development. Folate metabolism, found in both prokaryotes and eukaryotes, represents an essential druggable target for chemotherapy. Numerous enzymes in the cell replication cycle use folate either as a cofactor or as a substrate. DHFR, an enzyme of the folate biosynthesis pathway is an established chemotherapeutic target, initially explored for anti-cancer drug discovery. Diaminopteridines e.g. methotrexate and aminopterin, primarily used as anti-cancer agents, are folic acid analogues, first reported in late 1940’s, used to produce temporary remission of acute leukaemia in children. However, due to the toxicity of these drugs, they could not be used for other therapeutic implications such as in the treatment of infectious diseases. Development of newer diaminopteridine derivatives has helped in repositioning their therapeutic usefulness. These analogues have now been proven as anti-parasitic, immuno-suppressants, anti-bacterial agents, to enlist a few therapeutic applications. Likewise, diaminopyrimidine, diaminoquinazoline and diaminodihydrotriazines are being explored for structural modifications by which they can be repurposed from their originally developed medicinal applicability and exploited for various other infectious disease conditions. In this review, we encompass the study of DHFR inhibitors potentially to be repurposed for different infectious disease case scenario and also highlight the novel anti-infective drug discovery benefits therein. Keywords: DHFR inhibitors, Diaminodihydrotriazines, Diaminopteridines, Diaminopyrimidines, Diaminoquinazolines, New drug discovery, Repositioning. Affiliation:Department of Pharmaceutical Sciences and Technology, Institute of Chemical Technology, Matunga (E), Mumbai 400019, India. Keywords:DHFR inhibitors, Diaminodihydrotriazines, Diaminopteridines, Diaminopyrimidines, Diaminoquinazolines, New drug discovery, Repositioning. Abstract:Development of new drugs is a time-consuming, hugely expensive and an uncertain endeavor. The pharmaceutical industry is looking for cost-effective alternatives with reduced risks of drug failure. Validated target machinery along with established inhibitors indicates usefulness in drug design, discovery and further development. Folate metabolism, found in both prokaryotes and eukaryotes, represents an essential druggable target for chemotherapy. Numerous enzymes in the cell replication cycle use folate either as a cofactor or as a substrate. DHFR, an enzyme of the folate biosynthesis pathway is an established chemotherapeutic target, initially explored for anti-cancer drug discovery. Diaminopteridines e.g. methotrexate and aminopterin, primarily used as anti-cancer agents, are folic acid analogues, first reported in late 1940’s, used to produce temporary remission of acute leukaemia in children. However, due to the toxicity of these drugs, they could not be used for other therapeutic implications such as in the treatment of infectious diseases. Development of newer diaminopteridine derivatives has helped in repositioning their therapeutic usefulness. These analogues have now been proven as anti-parasitic, immuno-suppressants, anti-bacterial agents, to enlist a few therapeutic applications. 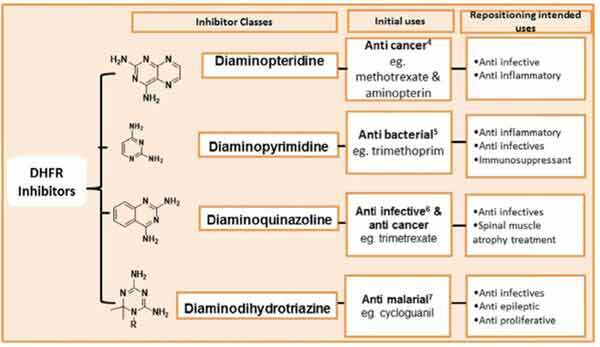 Likewise, diaminopyrimidine, diaminoquinazoline and diaminodihydrotriazines are being explored for structural modifications by which they can be repurposed from their originally developed medicinal applicability and exploited for various other infectious disease conditions. In this review, we encompass the study of DHFR inhibitors potentially to be repurposed for different infectious disease case scenario and also highlight the novel anti-infective drug discovery benefits therein.